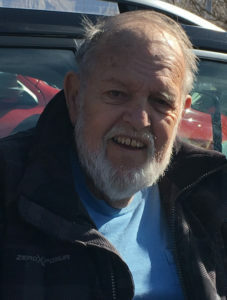 Arthur “Lee” Keach, Jr, age 80, of Grand Junction, Colorado, formerly of Williams Bay and Janesville, Wisconsin passed away peacefully on Sunday, 26 August 2018 from renal failure caused by diabetes. Memorial Services will be at 11:00 a.m. on Saturday, 22 September 2018 at Roseberry’s Funeral Home, 512 Main Street in Friendship, Wisconsin 53934. Interment at Mt. Repose Cemetery with Military Honors. Visitation at 10:30 a.m. until the time of service on Saturday. Lee was born 9 October 1937 in Oxford, Wisconsin to Arthur and Hildegard (“Jimmie”) Keach. He graduated from Adams-Friendship High School in 1955. He served in the Air Force and Coast Guard following graduation. Lee married Ruth Sherwood from Tomah, Wisconsin on 26 November 1956 and was blessed with three children, Cheryl, Randy, and Rebecca. He married Vicki Austin on 4 Nov 1967, who were blessed with a son, James. Lee and Vicki recently celebrated their golden anniversary in November 2017. Lee enjoyed fishing in the lakes atop the Grand Mesa and besting the gaming casinos. He remained an avid follower of Wisconsin Badger and Green Bay Packers football and a connoisseur of Wisconsin cheese, which he would frequently have specially delivered. He loved to make people laugh and never missed an opportunity to share a joke. My condolences to the Keach family. Peace be with you always. Our condolences with the loss of Lee. You have beautiful memories. We have learned to treasure those. Graduating class in 1955. Please know that I offer up prayers for you during this difficult time. We did not know lee but wish we had the opportunity to know such a fine man and his family however we are very fortunate to know his cousins and other family members who live in Wis, Our prayers to Lee’s family and other relatives and friends. To the Keach family and friends please accept my deepest condolences for the loss of your love one Arthur. Hope and comfort comes from God’s wonderful promise for the loved ones we have lost in death a resurrection back to life very soon for the righteous and unrighteous John 5:28,29, right here on a brand new Paradise Earth no more sickness pain or death Life Without End Revelation 21:1-5. Sending our love and sympathy to Lee’s family. We will see you on the 22nd.